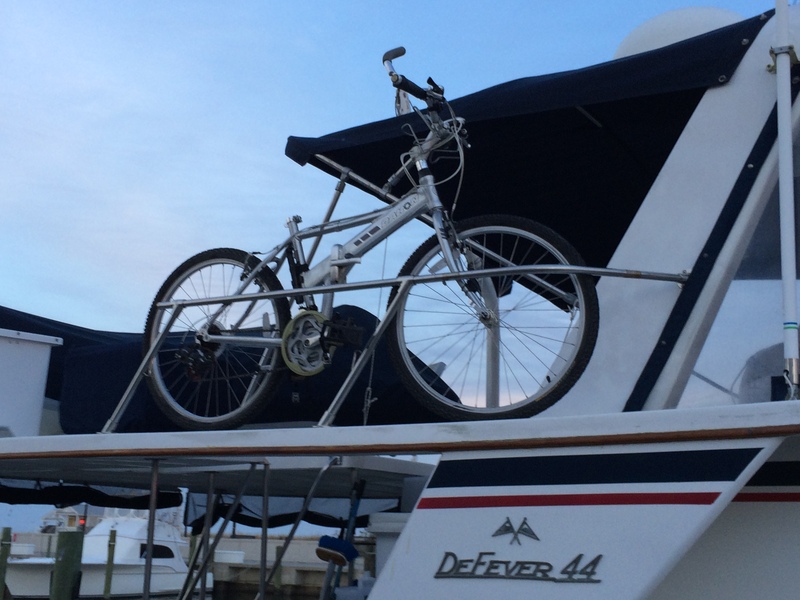 We have two folding bikes, which we had “stuffed” under the brow of the flybridge. But they took up way too much space, plus were difficult to get out, making them less likely to be used. 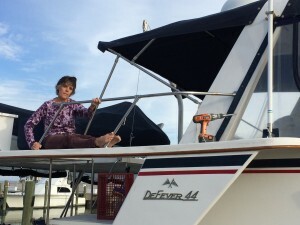 So we decided to make a rack for them on the starboard wing of the flybridge. I visited the local marine hardware store, and found all the necessary materials in their used stainless railing section. They even had a piece that was bent at the correct angle to match the forward edge of the wing. For about $85, I returned with everything needed for the new rack. Now it was just cut, piece, and mount the rack. I made 6 cuts with the cutoff blade in the hand grinder and fit them together. The hardest part was adjusting the uprights and side mounts to make the rail parallel to the deck. With all the parts in place, I drilled a pilot hole for each of the setscrews to keep them from slipping. 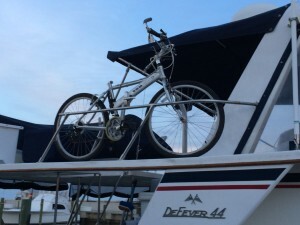 Once mounted, the bikes fit up next to the rail, secured by a tie-down strap. Then a locking cable keeps them from riding away on their own. We found a nylon motorcycle cover which fits over both bikes and even almost matches the color of the Bimini. So the bikes have a new home, and I’ve already filled the space under the brow!